Toast pine nuts in a frying pan over medium-high heat until fragrant and lightly browned. Wash and dry romaine lettuce. Cut into thin strips and set aside. Cube red beets and add to a large bowl. Peel watermelon and dice. Halve cherry tomatoes and add to the bowl with red beets and watermelon. Halve chili, remove the seeds, and finely dice. Zest and juice lemon. Add lemon zest, juice, balsamic vinegar, chili pepper, sugar, salt, and olive oil to a bowl, and stir until well combined. 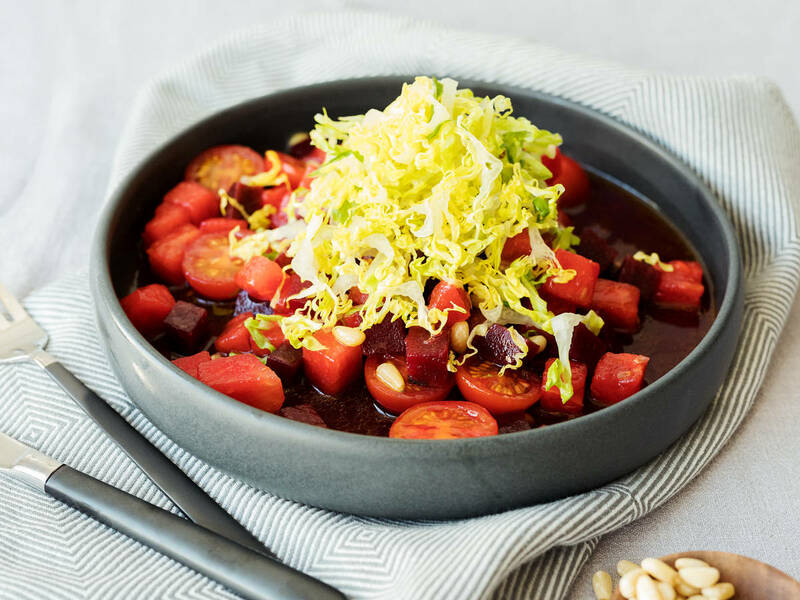 Serve the watermelon-beet salad with shredded romaine lettuce, toasted pine nuts, and balsamic vinaigrette. Enjoy!